I'm rolling along, trying to finish the many projects I've started. I'd do better if I didn't continue to start something new whenever the spirit moves me. It's really not so bad since the new projects I've started recently didn't take very long to finish so I can move on. Mittens and gloves don't take up much time. And so I bring you..
for Kim's friend, Krystal. It's the same kind of yarn, too. This color is blue/gray. It's nice stuff, acrylic/wool/nylon blend. 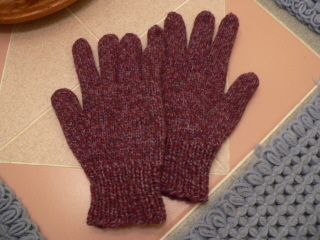 I also repaired a pair of gloves for Kelly today as well. 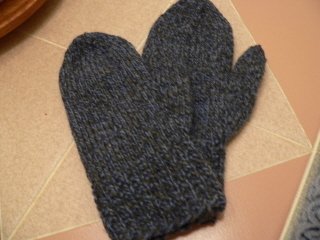 They're actually fingerless gloves with the mitten piece that goes over the fingers, making them mittens. Both thumbs on them had unraveled about an inch. I was able to find some black sock yarn that matched pretty well, picked up the live stitches and finished the thumbs again. 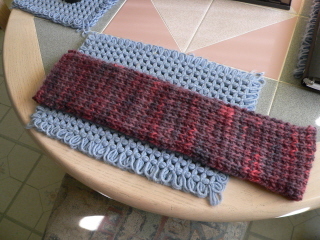 I'm also working on this scarf (please scroll down to Oct. 12 - I don't know how to link to one part of a page!). 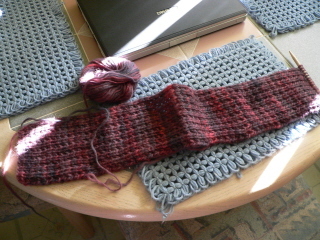 Although mine is all one color and certainly not handspun, I'm liking it so far. It's Paton's 100% classic wool, leftover from Janet's shawl. 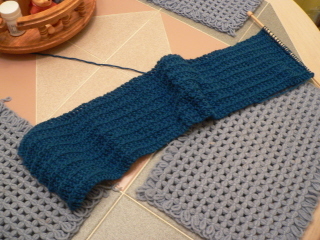 The pattern is easy enough to remember and interesting enough to ensure that I'll finish it. Nifty, huh? Weird, though, how the color is so totally different in this picture. I always try to take my project pictures without flash, if possible, to get the best representation of color that I can. Doesn't always work, obviously. For the rest of this week, I'm going to attempt to finish two pairs of socks before I start anything else. I'm also determined to make some progress on two sweaters I'm working on. 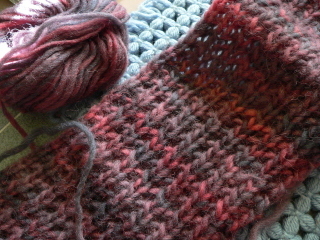 It's so much easier to keep casting on another sock, mitten or glove that I can finish quickly. It's tempting, actually. Sigh. I would like to finish these sweaters and possibly be able to wear them sometime before it gets warm. We shall see, hmm? Here it is folded over. It's about 40 inches long, enough to wrap around my neck under my coat. 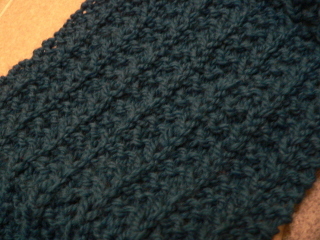 The pattern looks pretty with this yarn. The weather is warming up a little today. It was so cold yesterday, windy too. 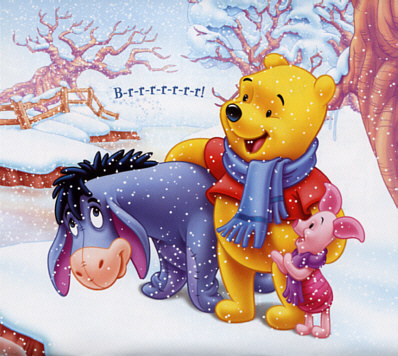 Pooh stays warm with his scarf. Ta-ta! Wow. Just wow. The two people who read this journal must have thought I'd fallen off the face of the earth. Nah. I just wasn't inspired enough to bother to change things around here. Let's see, what have I been doing the whole month of February? Bill and I just got back from a brief vacation in Charleston, South Carolina. Charleston is a beautiful, old city with some lovely architecture. 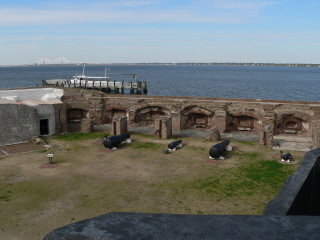 We wanted to go there to see Fort Sumter. A couple of summers ago, we visited Appomattox to see where the Civil War ended. We thought it would be fitting to see where the war began. 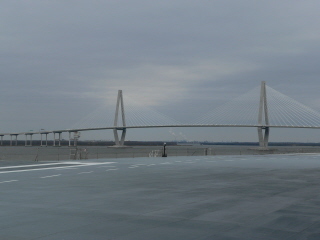 We stayed at a really nice resort hotel, which is across the Cooper River Bridge from the city of Charleston. This is also called the Arthur Ravenal Bridge. It's brand spanking new, just opened about a year ago in late 2005. The coolest thing, for you in the NY area, is it's free! No toll. Amazing. The hotel, the Charleston Harbor Resort and Marina, is really beautiful. We didn't even realize it when we made the arrangements but the hotel is literally right next door to the ferry dock for the trip to Fort Sumter. Go figure. 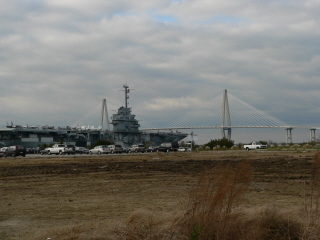 It was also right next door to the carrier Yorktown. This picture was taken from the parking lot of the hotel. Seriously, it was within spitting distance. Anyway, obviously, this was a must-see. We've been to the Intrepid in NYC but the Yorktown had more exhibits. There are, I believe, six self-guided tours. We did the first three. 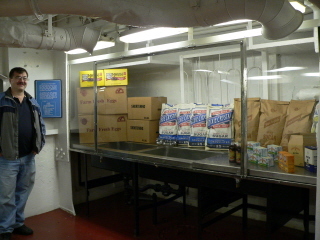 You can tour the living quarters, medical and dental facilities, mess halls, kitchens (galleys? ), the bridge, etc. We probably spent about 2 1/2 hours on the ship. My favorite was the bakery. 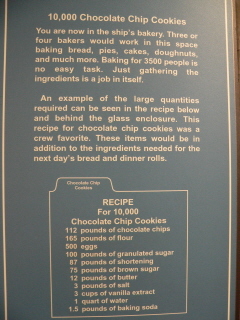 Just to give you an idea how many men this ship can hold, the bakery exhibit included a recipe for 10,000 chocolate chip cookies. Here is a picture of the ingredients for 10,000 chocolate chip cookies. How long will 10,000 chocolate chip cookies last on a ship this size. One day. Yep, that's one day. 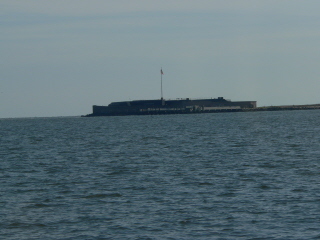 Later in the day, we made the trip to Fort Sumter. The ferry ride takes about half an hour. 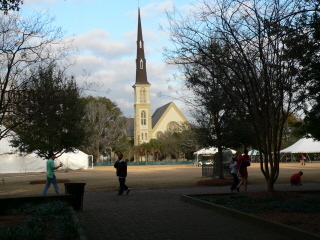 I'm not sure what the weather normally is in the Charleston area but when we were there, it was cold, in the 40's. When I checked the weather a week before we took this trip, the temps were in the high 60's. So, this ferry ride over was chilly, even down inside the boat. 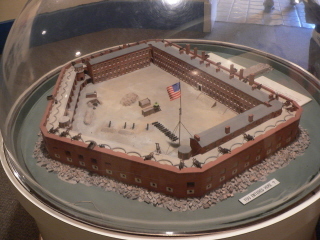 This is a model of what the fort looked like at the time of the battle. As always, when we visit these places, the park service employees are so passionate about the places that their talks are very compelling and fascinating. We were on the island for one hour and it seemed like minutes. I didn't know it but the fort was in operation until WWII. This picture was taken from the top of a large, black structure that was built during the Spanish American War. The museum is in this structure. The first shots were fired April 12, 1861. 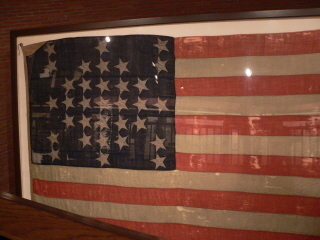 The flag that was flying over the fort at the time was shot down during the battle. The federal troops surrendered on April 14, 1861. This flag was raised once again on April 14, 1865, when the Northern forces again took possession of the fort. Major Robert Anderson, who was in command in 1861, was now Major General Anderson, retired. He was in attendance when the flag was raised. 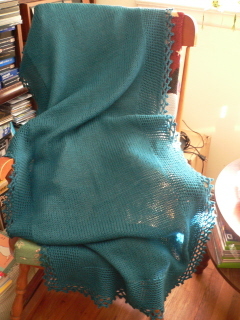 Jumping around here a little, here's a shawl I completed before the trip. 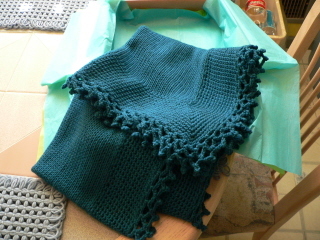 It's similar to mine but with a different crochet border. I made it for my cousin, Janet, and mailed it before we left on vacation. Very pretty, if I do say so myself. 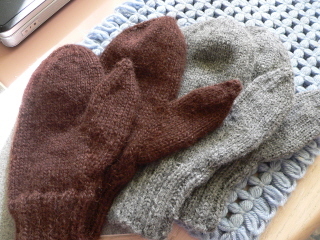 While on vacation, I finished two pairs of mittens. The brown ones on the left are for me. They're alpaca, very warm and soft. 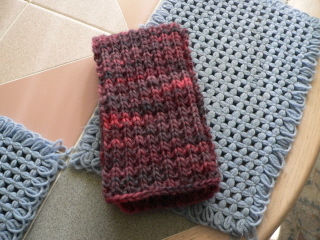 The gray ones are for Kim and are wool/acrylic blend. While in Charleston, I found a yarn shop that was so wonderful, I could have spent my entire vacation there. Knit, short and sweet, is in an old house and I loved the way the yarn was displayed in the various rooms. There are comfy chairs and couches with baskets spilling over with soft, beautiful yarns. Heaven. One room was almost entirely filled with sock yarn. I found some beautiful colors and textures. I also found yarn for a scarf for myself. So far, I have resisted the urge to knit with those huge needles but I've wanted a nice scarf for myself and this pretty yarn from Artful Yarns (name is Shakespeare) was irresistible. With size 11 needles, I'm using the broken rib pattern, which I love. I knit that much yesterday, even with Lorelai here. Yep, it's fast. I estimate I'm about halfway through but I'm just going to go until the yarn runs out. A close-up of the soft, pretty colors. Speaking of Lorelai, I can't believe how much I missed her in a week. She's growing so fast that even a couple of days will see a difference in her progress. She's walking along the couch and chair and seems so much steadier. Give her a month or two and she'll be running around. She just wants to walk around and reaches for my hands to walk with her. Her signing skills are improving as well. She can sign milk when she wants a bottle, which makes life much easier than trying to figure out what it is she wants. She also signs eat but with her whole little fist instead of the closed hand shape. Last but certainly not least, my "baby", Billy, turned 25 this past Saturday. Holy cow. Well, that's what I've been up to this month. I'm off to try to stay warm. Ta-ta!